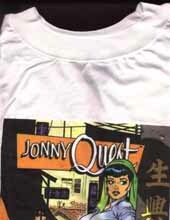 A T-shirt produced by Graphitti Designs in 1987 and offered by Comico, in conjunction with their Jonny Quest comic books. Original image by Doug Wildey. Click on the image to see a close-up of the graphic (courtesy Scotty Phillips). 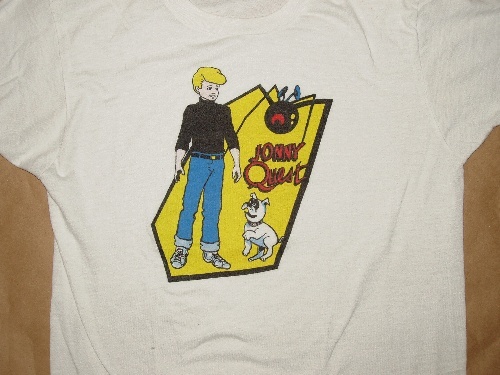 A closer look at the Doug Wildey graphic for the 1987 Comico Jonny Quest T-shirt is at left. Follow this link to see another version, without Jade, supposedly offered as a publicity cel by Hanna-Barbera. And, finally, here's a remake of the original Doug Wildey graphic by Mike Royer (again without Jade) as a line drawing; this was produced as part of the work done for a coloring book. 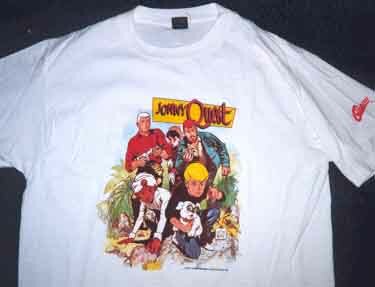 Another T-shirt produced by Graphitti Designs in 1987 based on Comico's issue 5 cover, in conjunction with their Jonny Quest comic books. Original image by Dave Stevens. Click on either image to see a larger version (courtesy Scotty Phillips). Here's the back of a T-shirt sold at Universal Studios Florida, copyright 1993. Close-up. Front. 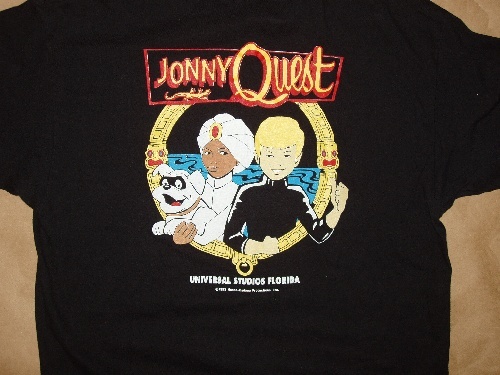 Universal Studios Florida was selling this T-shirt in 1995 in the Hanna-Barbera Store. Above is the design on the back. 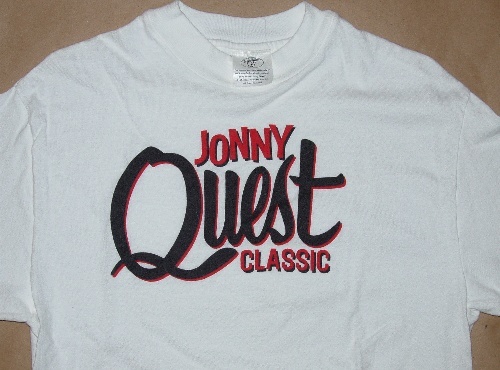 The front featured the "classic" version of the logo. 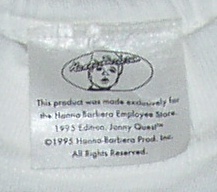 The back image was used as the front of another T-shirt, date unknown. 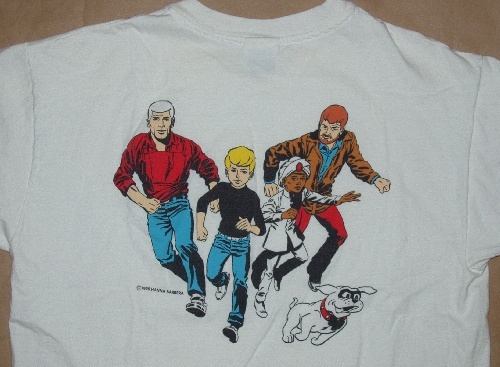 This T-shirt was sold in the Hanna-Barbera Employee Store and was produced in 1995. 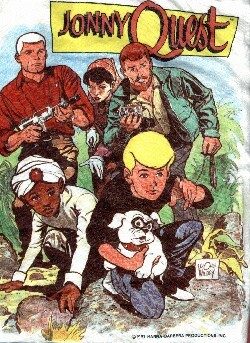 Its tag (below) featured the Jonny Quest version of the Hanna-Barbera logo. 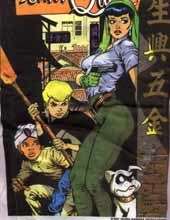 This unlicensed T-shirt was available in the early '90s, at least at one Austin, TX, comicbook shop.